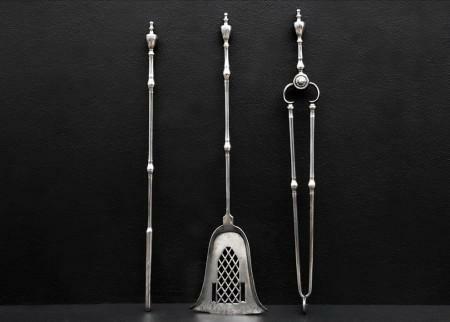 An elegant set of 19th century English steel firetools. The faceted octagonal handles with turned motif to shafts. Pierced shovel. 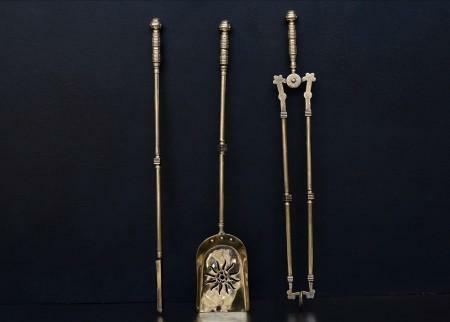 A set of 19th century steel firetools. 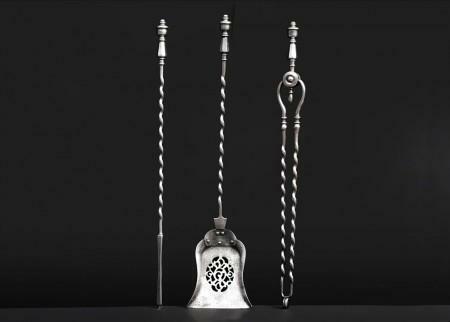 The barley twist shafts surmounted by tapering octagonal handle with bell shaped finial. 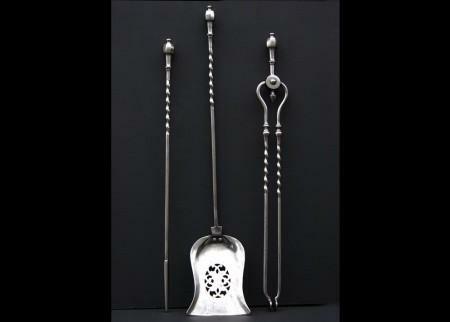 Shaped, pierced shovel. A very fine set of English Georgian steel firetools. The large, elegant pan with pierced diamond pattern, the shafts with swells to centre, the heavy urn handles with engraving. Exceptional quality. Late 18th or early 19th century. 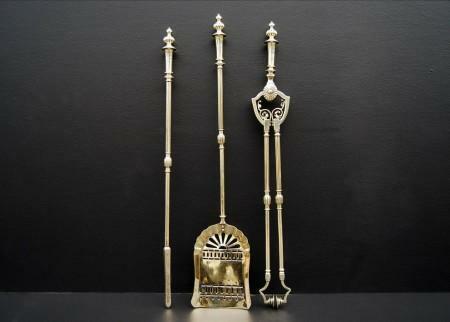 A set of attractive late 19th century brass firetools. 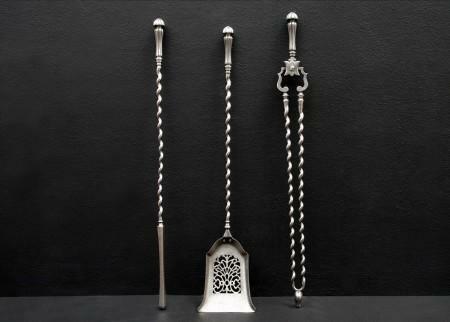 The tong delicately engraving, reeded tops and sunflower design to shovel. 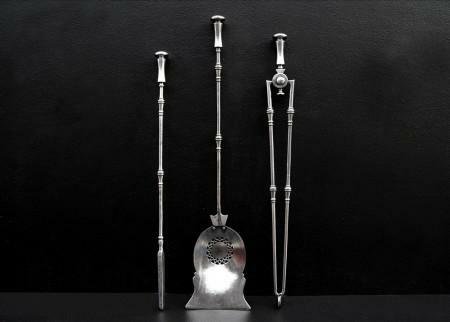 A set of 19th century steel firetools with octagonal lozenged handles, shaped shovel with pierced design. 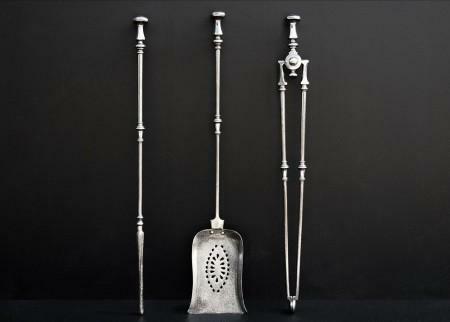 A set of unusually large 19th century English steel firetools with decorative pierced shovel. 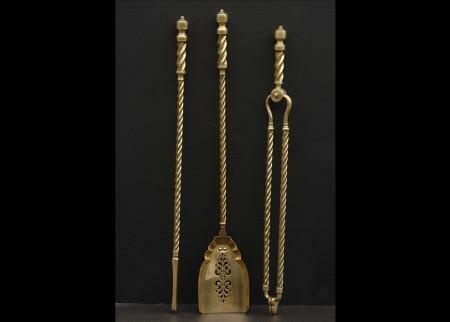 A set of unusually large English brass firetools. Half fluted shafts, surmounted by finely serrated design to gadrooned finals. 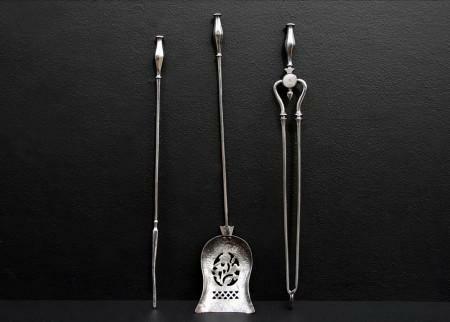 Pierced bell shaped shovel, and attractively shaped tongs. Late 19th century. 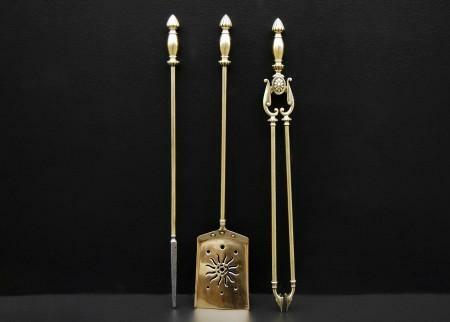 A set of late Victorian brass firetools, with barley twist stems and handles. Pierced shovel. 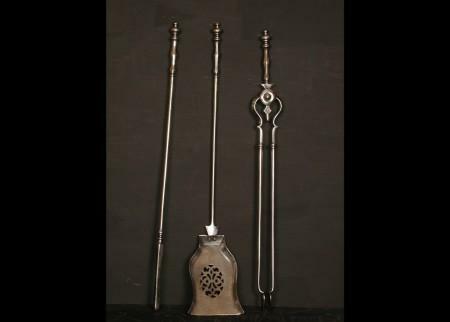 A set of mid 19th century steel firetools, with octagonal finals, barley twist shafts, and pierced shovel. 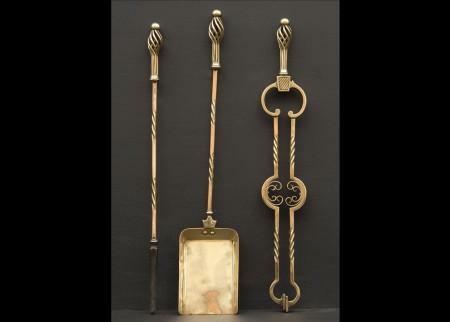 A 19th century English bronze and steel firetools, with barley twist shafts and Egyptian style handles. 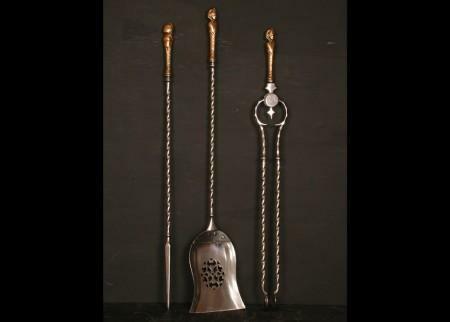 A set of 19th century English steel firetools. 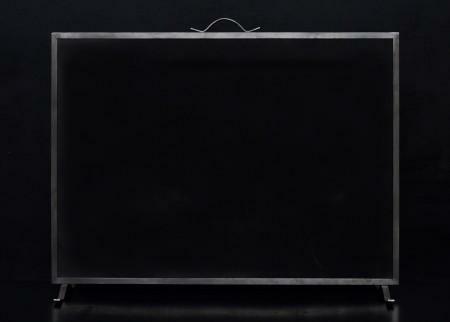 A polished steel firescreen of rectangular form. Shaped handle and feet. New. 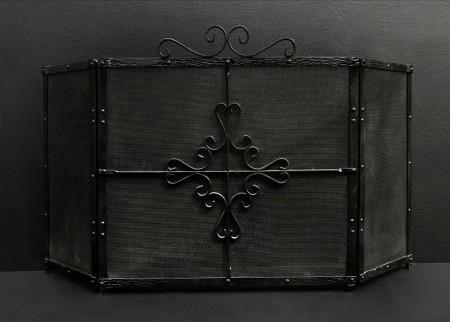 A large and impressive Neo-Gothic firescreen. The arched feet surmounted by barley twist shafts and shaped finials. The central frame with scrollwork, clovers and a pair of working doors with rosette adornments throughout. An impressive piece. English, 19th century. 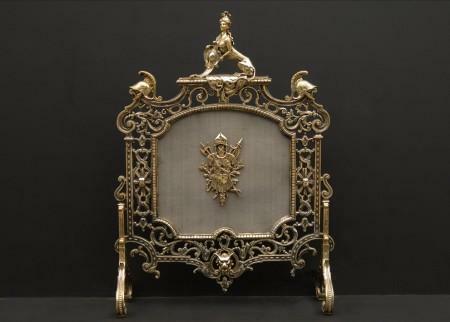 A fine quality 19th century English Regency style brass firescreen. 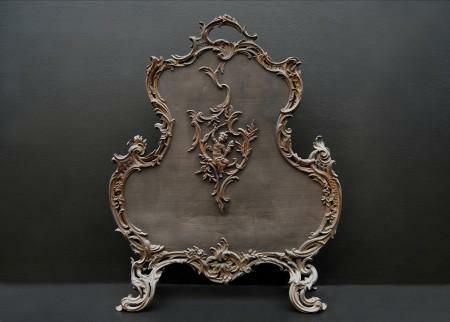 The handle with leafwork and ribbons, the frame with torch finials to top and swags below. Black mesh behind. 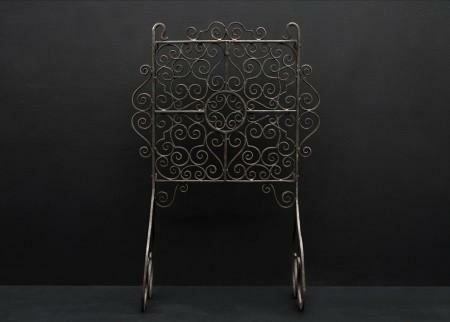 A pretty and very delicately scrolled wrought iron firescreen with scrolled feet. Early 20th century. Very fine quality. 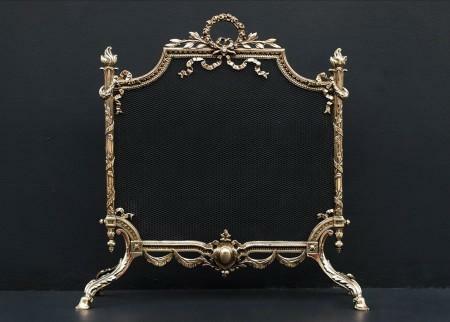 An iron three-fold firescreen with scrolled handle and decoration to front. Minimum width 24.5″. The two returns are each 10″ wide. 20th century. 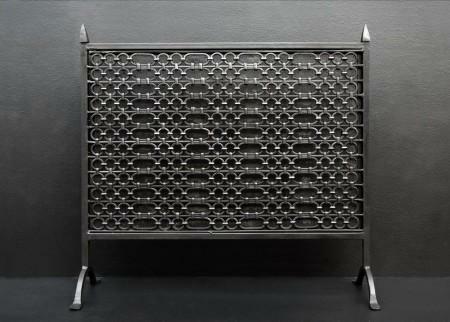 A heavy yet elegant cast iron firescreen with circular and oval ring pattern to front and fine mesh behind. Early 20th century. 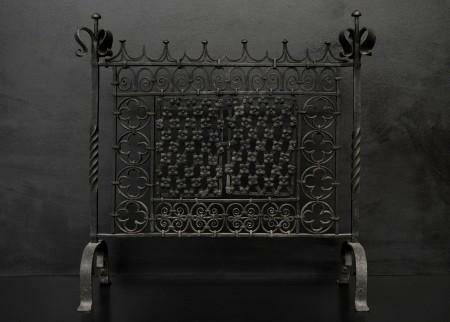 A large English wrought iron firescreen with scolled motif throughout. Blacked mesh behind. 20th century. 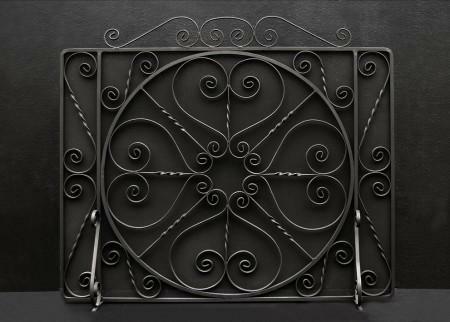 Small wrought iron firescreen with scrollwork design. Could be polished if required. A good quality brass firescreen with cast scroll and leafwork, heraldic mask to base, helmets and mythical female figure to top. Military figure detail to mesh. Early 20th century. A simple rectangular fire basket. The plain front bars with Gothic styled finials above. Nice quality patina to metal. English. 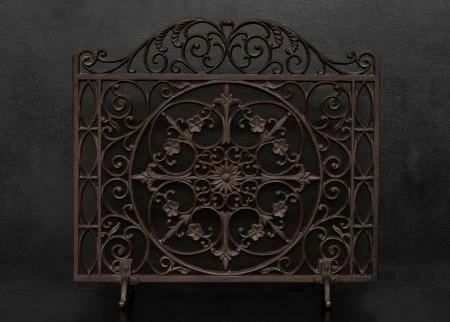 An English brass and steel firegrate. The turned brass uprights with shaped feet below, the brass fret with shell to centre. Shaped back behind. 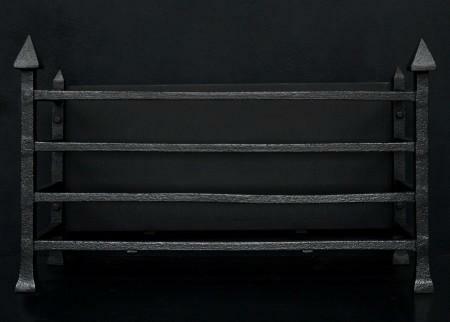 A George III style polished steel firegrate. The tapering legs surmounted by urn finials, the fret with swags and paterae throughout, with sausage-and-pea beading above and below. Plain cast iron fireback behind. English, circa 1900. 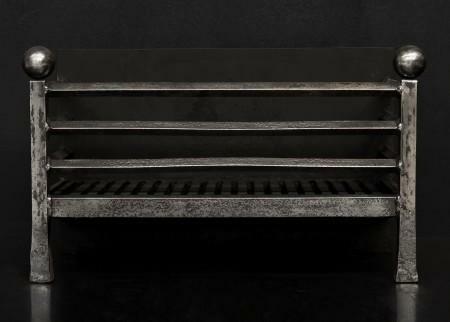 A polished steel fire basket in the Georgian manner. 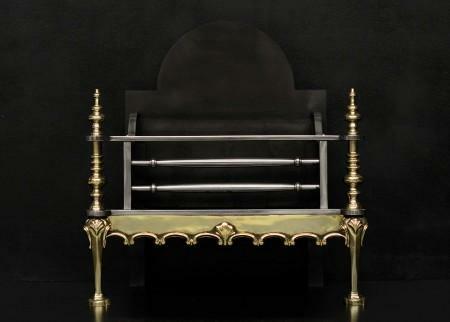 The tapering legs surmounted by urn finials, the burning area with shaped front bars and pierced, fluted fret below. 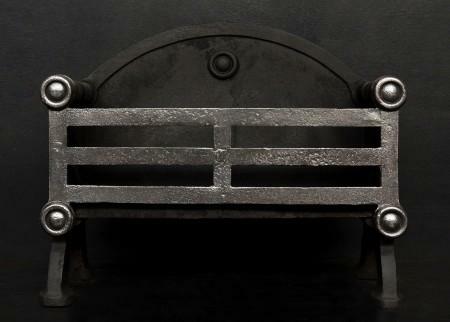 Shaped cast iron fireback. English, circa 1900. A decorative brass and steel firegrate in the Georgian manner. The tapering, fluted legs surmounted by Ionic capitals and urn finials. 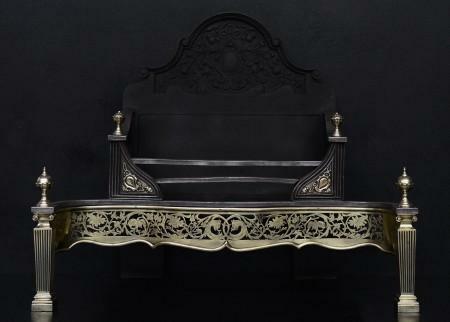 The pierced fret with scrollwork, foliage and beasts throughout with dual front bars to shape burning areas. 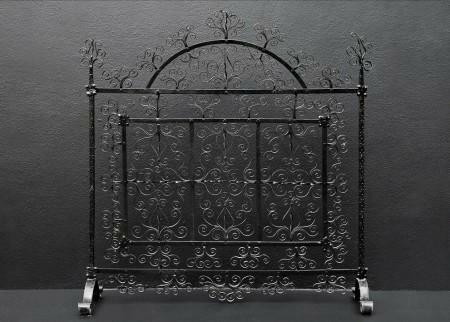 Decorative cast iron fireback behind. English, circa 1900. 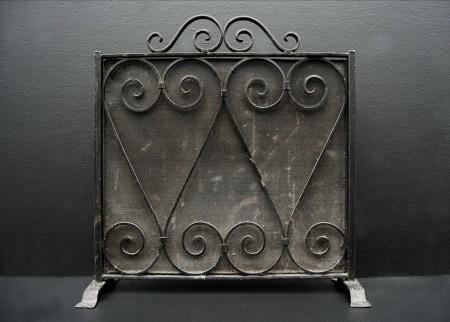 A late 19th century cast iron firegrate in the Georgian manner. 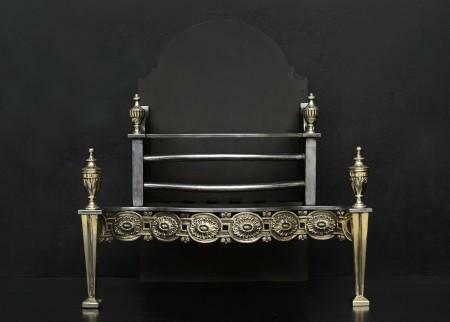 The serpentine fret with cast brass paterae, flanked tapering legs surmounted by urn finials. The burning area with shaped front bars and cast iron back behind. English, circa 1900. 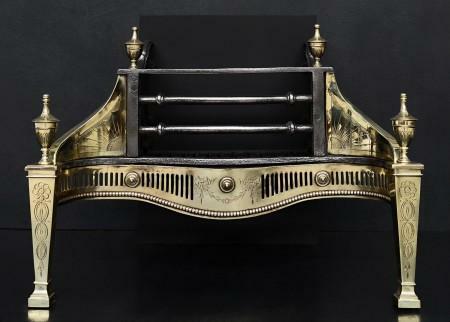 A mid 19th century Georgian style brass and steel firegrate. The deep engraved fret with storks, scrolls and urn to centre. 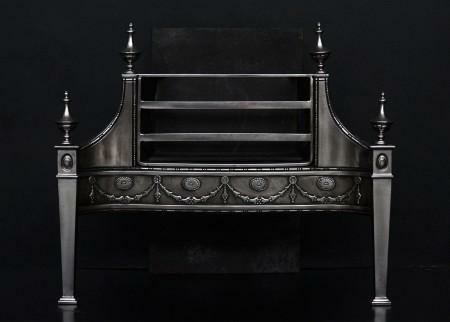 Engraved side wings, finials and feet, shaped front bars and cast iron back with urn. 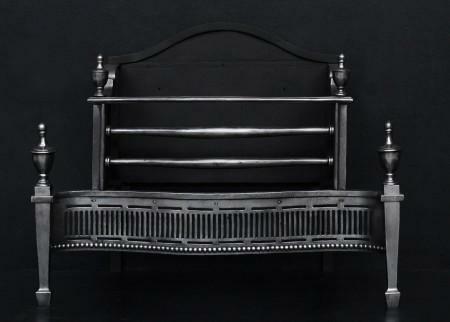 A simple yet elegant English firegrate in the 18th century style. The tapering legs surmounted by ball finials. Square front bars and plain back behind. English, circa 1900. 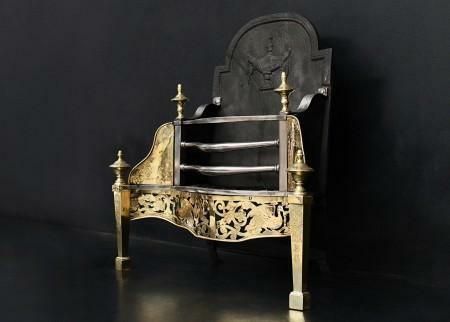 A George II style brass and steel fire grate. The tapering legs with engraved flowers surmounted by urn finial. The pierced fret with rosette paterae and beading. The bowed burning area flanked by engraved side wings surmounted by urn finials. Plain back behind. English, 19th century.